Let’s wrap up this project. In the earlier post for this project I discussed all the preparation needed for bedding the rifle. The last step before I started mixing the bedding compound, was to apply some sort of release agent on the metalwork. 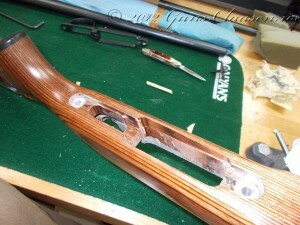 If this is not done, the action will be permanently glued to the stock which is not a good idea. There is various ways to do this. Two commonly used methods is to cover everything you do not want to stick together with Johnson paste wax or Kiwi neutral shoe polish. I used a commercial mold release agent known as Frekote, manufactured by Henkels. As this is in an aerosol can, it is quick and easy to apply. The next step was to apply the bedding material. Once this is mixed, you have about an hour of working time. One of the challenges in our NRA gunsmithing school programs is the fact that firearms can not be left at the school overnight. 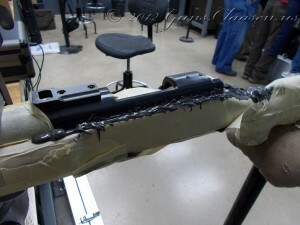 During our normal semester classes this occurs and we would enter firearms into a bound book as required by law. As we could not do that, this process had to be done early enough in the day to allow for the compound to dry in time. There is many products that can be used for bedding and for this project, I used Devcon Plastic Steel. One of my classmates shared his with me (thank you Will) which meant we had enough compound for two stocks and did not need to measure the components for just one bedding job. 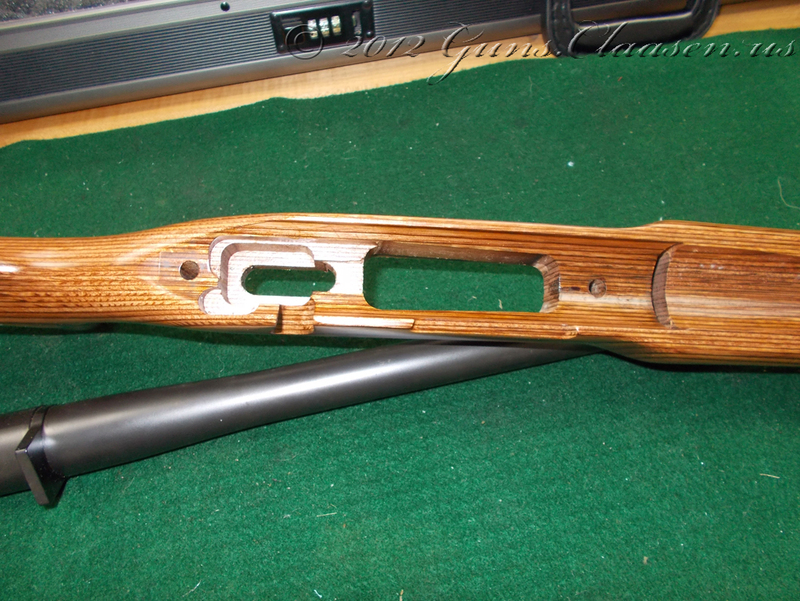 I filled the stock with bedding compound and removed all the air bubbles from the recesses of the stock. 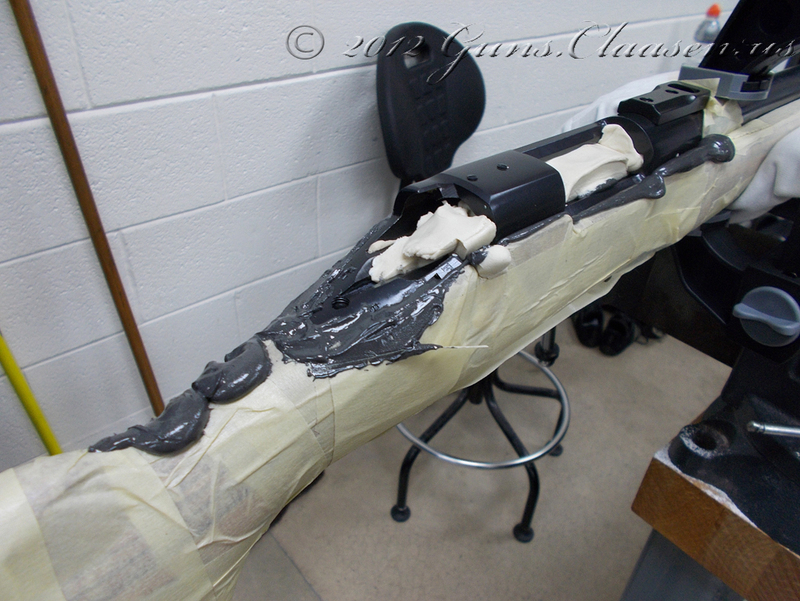 I also applied bedding compound to the pillars and made sure I had full coverage of those. 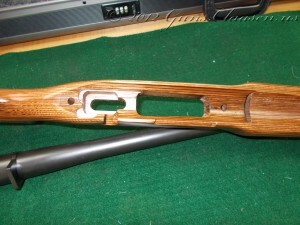 The barreled action is then inserted into the stock. Hydraulic pressure on the compound allows it to push out where it is not needed and fill up any gaps and voids. 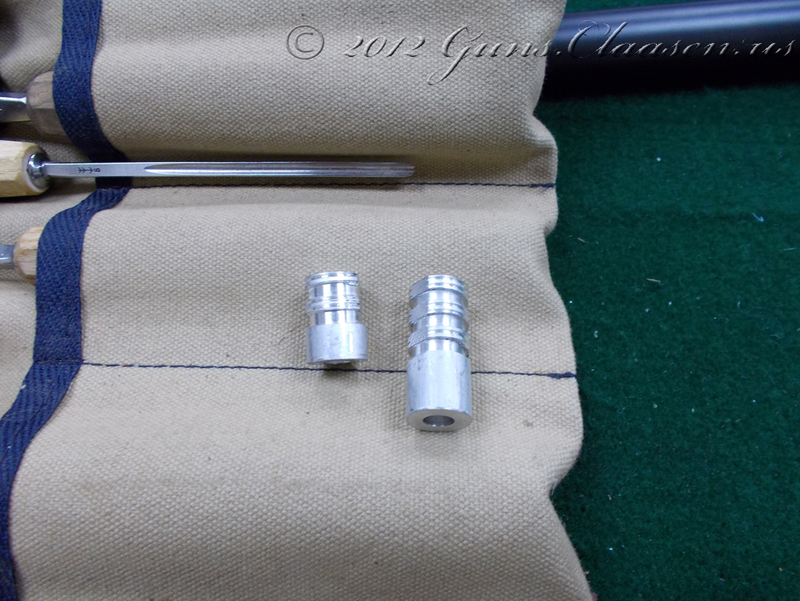 The action is then clamped to the stock and left to set for about an hour or so. Once the compound starts to set and reaches a consistency of putty, I started trimming of any excess from around the action. Not only is it easier to do at this time, it also prevents the compound from hardening over certain areas and capturing the action. The bedding compound is then left to set for a few hours. This period will depend on the type of compound used. While waiting for the compound to dry, the class went to lunch and after coming back we had some class room sessions where various other aspects of accurizing were discussed. 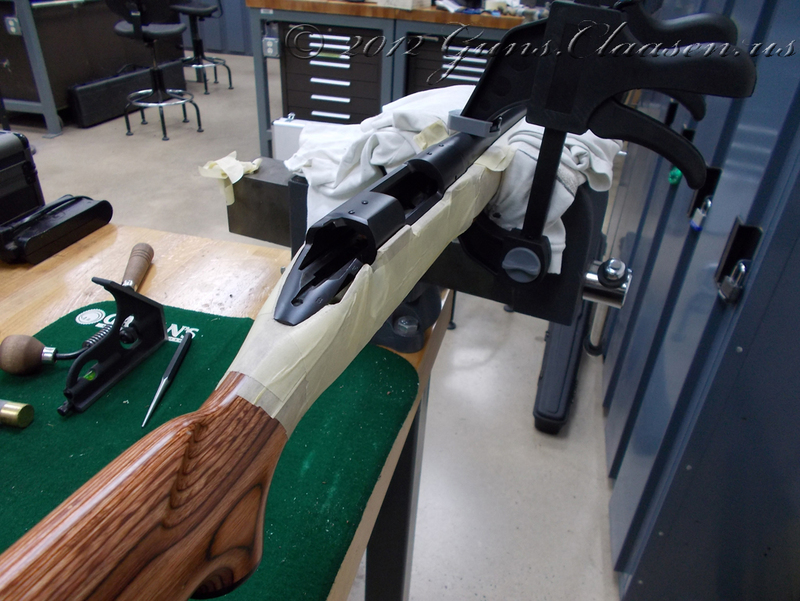 Before leaving for the day, the action was removed from the stock (to make sure it does actually come out before the compound totally sets) given a light cleanup and then clamped back into the stock. The next morning, I removed the action from the stock and completed cleaning up the action. I then returned the stock to the mill and removed all the bedding material that would interfere with the working parts of the rifle. Once all of this was completed, I reassembled the rifle and made sure it functioned correctly. There was not time to shoot the rifle after completion, but I did have time a few weeks later. I did have to sight the rifle in and I was using surplus ammunition so I can not say for sure how much better the rifle is. However, with me shooting (and I freely admit to not being the best shot in the world) the rifle on a bench and only using a bipod the rifle shot noticeably better groups than before. I am planning to do a range day using some match ammunition soon and will report the results when I do that. 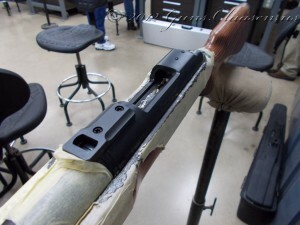 In the only full week between the spring and summer semesters, I signed up for a NRA short-term gunsmithing course for Custom Accurizing on the Remington 700. 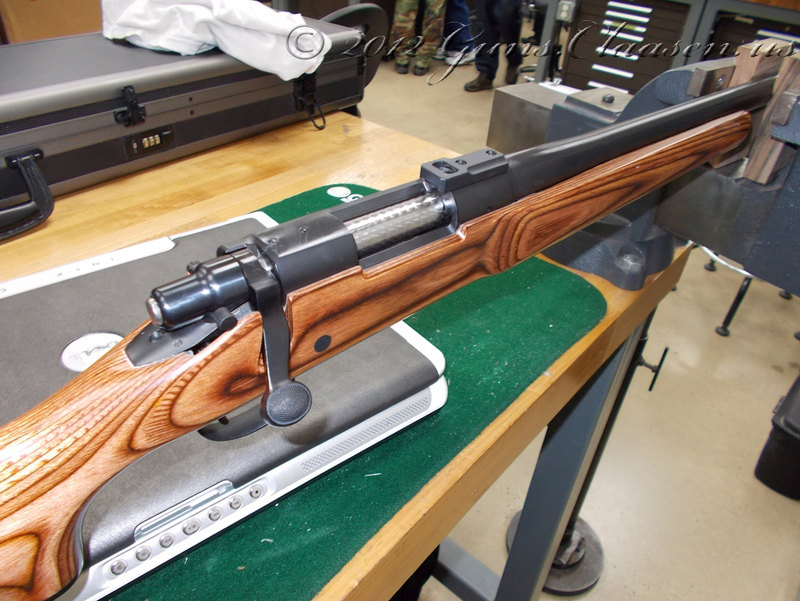 The instructor was Thomas Marshal, who spent many years working with the Army Marksmanship Unit on theses rifles. I am splitting the work from this week into two sections and will cover all the preparation work in this post. 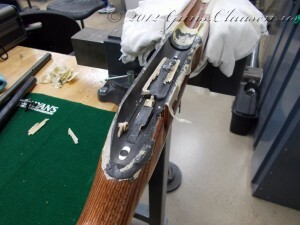 While we received general instruction on these rifles and the things that can be done to them to improve the accuracy, the main focus of the course was to do a bedding job on a rifle. 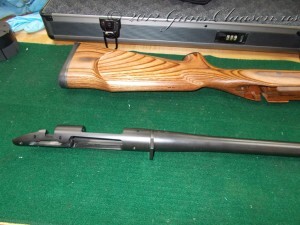 A good bedding will ensure there is full contact between the stock and the action and will prevent the action from moving around when the rifle is fired. I used a Remington 700 VLS with a 26″ heavy barrel from my collection that had no modifications. As always, I started by removing the action from the stock, removing the bolt and trigger system. 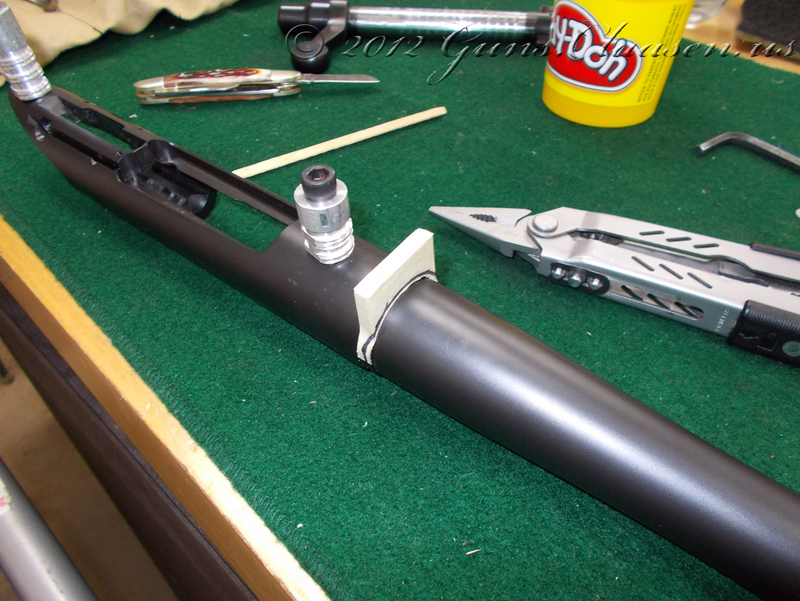 As I did not intend to do any work on the action or barrel, there was no need to separate the barrel from the action. Another option when bedding a rifle is to use pillar beds. These non compressible pieces are bedded into the stock. There are a variety of commercial pillar bedding components available on the market, but they can easily be made on a lathe. I made sure they were the correct length and then flattened the sides to prevent them from turning if they should happen to release from the bedding agent. The next step was to tackle the factory stock and prepare it for the bedding compound. 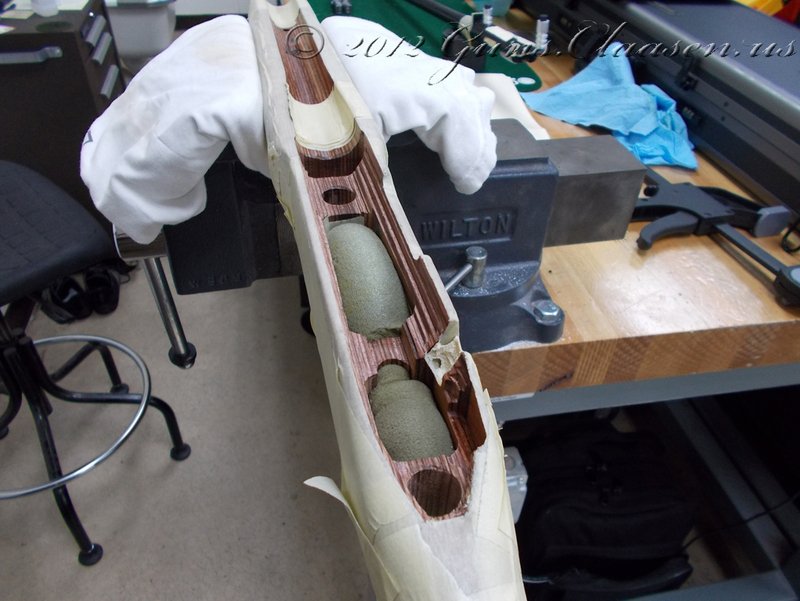 Most of this was done on a mill and involved removing small amounts of material from the stock. This is then filled in by the bedding compound. 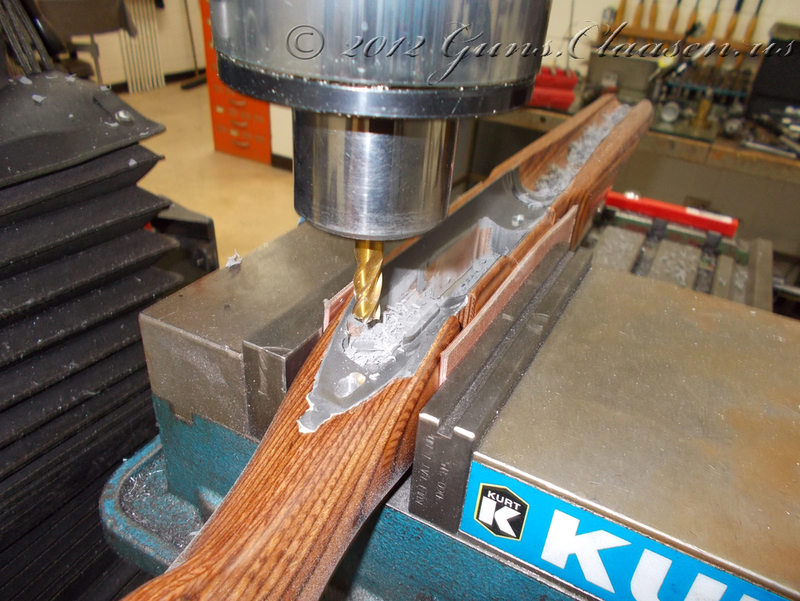 The square cuts from the endmill also give the bedding compound more surface area to adhere to. 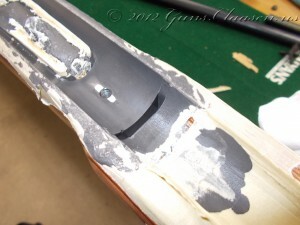 The area around the recoil lug is also enlarged. You can also see where I enlarged the original screw holes to fit the pillars. I then applied tape to the stock to protect it from the bedding compound. The compound sticks to everything and is really hard when it sets so this is important. 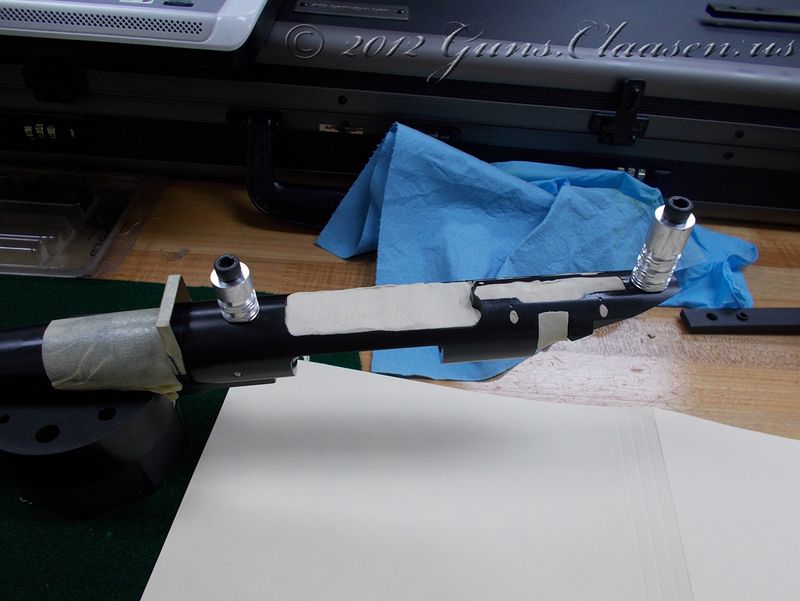 I also used spacers in the barrel channel to ensure the action goes squarely into the stock. 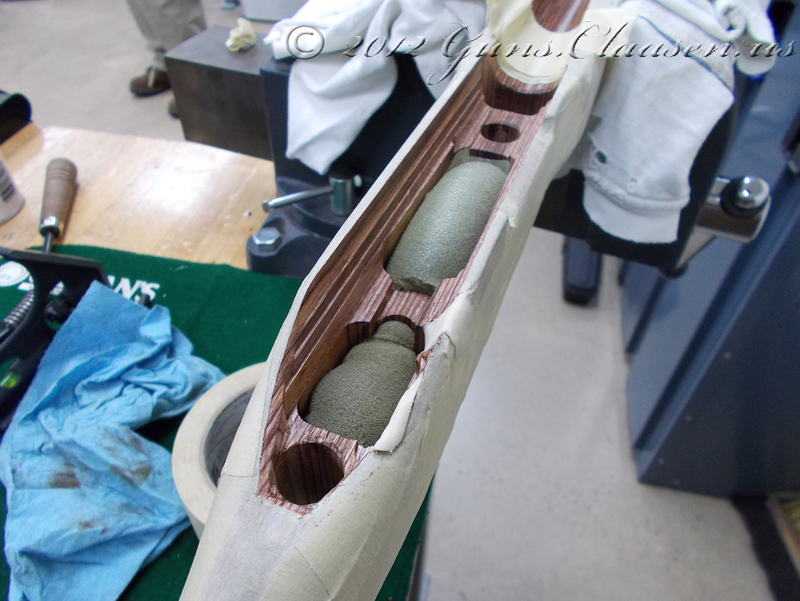 Once I completed this, I started filling up all the large holes in the stock where components of the rifle would normally be. Yes, I used sponge to do that. The action also needs some preparation. 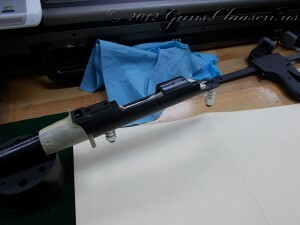 I mounted the pillars to the action and taped the front of the recoil lug. 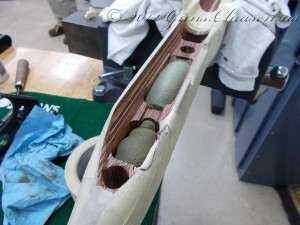 The rear of the recoil lug sits against the bedding material. 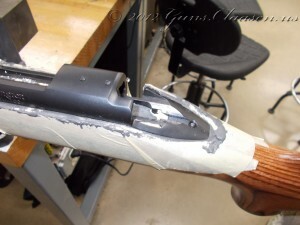 In some of the following pictures, you will also see where the first part of the barrel is taped. 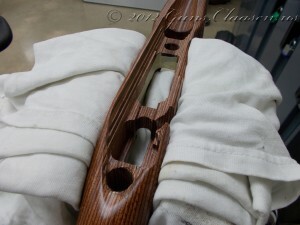 Here is the stock ready for bedding. I do still need a small dam in the barrel channel to prevent compound going down the channel. 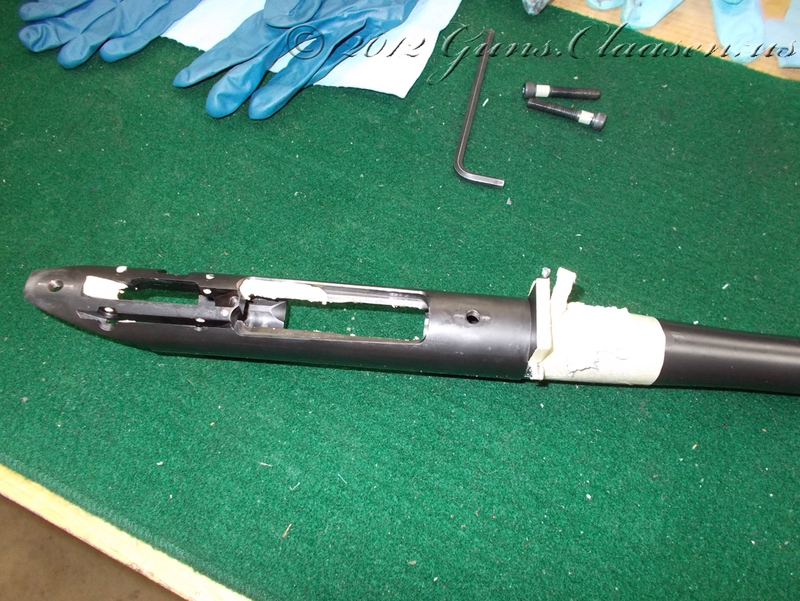 You can also see the dam I made on the stock where the bolt handle goes. 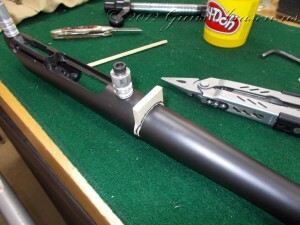 This is to prevent compound spilling down the side of the stock. The action is now also ready for bedding. The parts of the action where we do not want any compound to go is filled in. This can be done with a few things, such as plumbers putty, silly putty or (in my case) Play Doh. In my next post, I will go through the process of applying the bedding compound and cleaning up.